This antioxidant-rich, flavorful water is such a treat! Made with chamomile tea, the infusion is the ultimate refresher on a hot day, plus your water bottle can be refilled for a second infusion. No straining is required since you are using bagged tea. I am using Trader Joe’s Organic Chamomile in this mix. 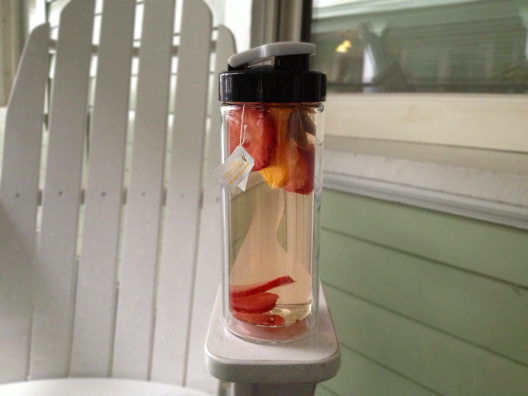 Recipe: 1 bag organic chamomile tea + 1 sliced organic strawberry + 1 half of an orange slice, cut into two quarters. 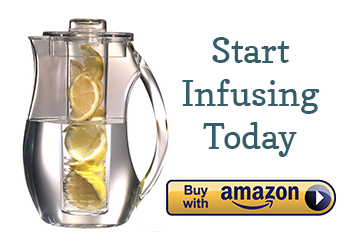 Combine with water and let infuse for 1-4 hours. If infusing for longer than 2 hours, remove the tea bag because the chamomile will overwhelm the flavor. The water bottle you see in this picture is an 18 oz Sun Tea’s Double-Wall Glass Travel Mug. I originally purchased the travel mug to transport hot tea to work, but the double walled insulation also keeps drinks icy cold. Glass is the ideal water bottle material since many plastics have BPAs and metal water bottles leave a taste reside. I tried this chamomile strawberry orange water, i don’t know how it should taste like. the water i have taste more on the chamomile tea with a little smell of orange and strawberry. Is it suppose to taste that way? Hi, Jesslyn. If the chamomile is overwhelming the fruit flavors, try removing the tea bag after an hour, then letting your fruits infuse for longer. Hope that helps!